We just bought 400 pounds of vintage graded cards. Yes, you read that right…400 pounds, which is about 2,600 graded PSA, SGC, & BGS cards, worth tens of thousands of dollars, all collected by a single man out in Pasadena, CA. 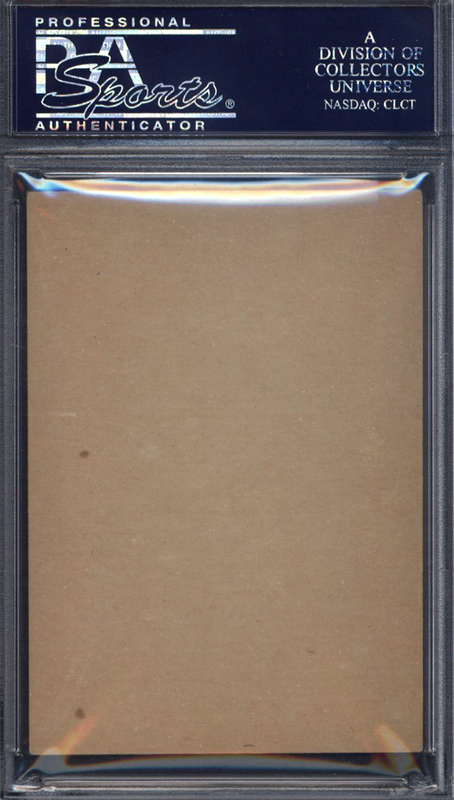 It was the largest collection of graded cards we’ve ever bought, and we couldn’t be more excited. A few months ago, we received a call from a collector out in California, who mentioned that he was interested in selling his collection of cards. This one started out kind of slow, with both of us trying to get a sense of one another, basically conducting interviews (and rightfully so). We were asking him what years his cards are from and his highlights, he’s asking about our appraisal process. We're asking him about the condition of his cards, he's asking us if we travel to buy collections. And so on. After about ten minutes of going back and forth, he had realized that we were the real deal, and we realized that he was definitely interested in selling – so we needed to get the process started right away. Turns out this card fanatic has been collecting cards religiously since the 1960s, and now had over 2500 of them in his collection. He collected everything, and I mean everything. 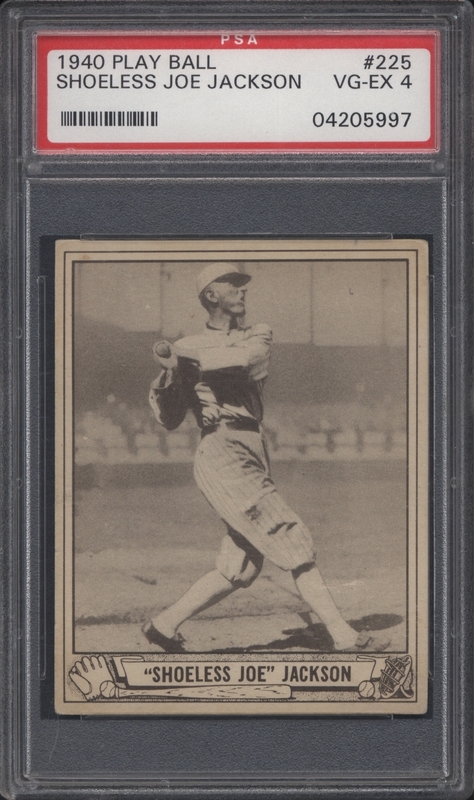 Tobacco cards, candy cards, type cards, test issues, specialty issues, meat promos, stars, rookies, Hall of Famers, future Hall of Famers… everything from a T205 Christy Mathewson to a Mike Piazza rookie card. Just incredible. And to top it all off, every single card in the collection is professionally graded! Once he forwarded over the excel spreadsheet of his collection, it took us a few weeks to complete the evaluation. There’s just no other way around it, you have to value every single card, and it takes time. When it comes to a collection like this, you can’t just ballpark a figure and make a bogus or low-ball offer. That can be detrimental in two ways. For one, you could be making a mistake worth thousands of dollars hurting your business if you “guess” wrong. Two, think about how the seller feels. He’s spent 45 years putting this collection together – do you think he wants you to spend 10 minutes making up an offer? That would just be unprofessional and disrespectful. He actually went down that road with a few of the industry’s “big dawgs” and was turned off right away after being made several quick low-ball offers. So, when he came to us, he was as patient as ever. It did take a few weeks to get everything in motion...but it was well worth the wait! Once we both confirmed that we were on the same page in regard to what the collection was worth, we hopped on the next plane to L.A. From there, we took the short drive up to Pasadena and met at his house to discuss numbers. We chatted for about a half hour, and agreed to terms. That was the easy part. As long as everything matched up, the deal was good to go. The hardest part was yet to come. Do you know how long it takes to cross reference 2600+ cards? About eight hours. Yes, eight straight hours of sorting, counting, and verifying. We obviously can’t list every single card in the collection, or even show you them all in one picture, so I’ve gone through and hand-selected what I felt were the highlights. Most of the collection was mid-grade, but almost every single card has tremendous eye-appeal, as most are stain-free, crease-free, and well-centered. You have to give this guy credit for having the foresight to collect the way he did. He bought quality cards, in good condition, that were well-centered. And I can’t stress the “well-centered” enough – especially with the way the hobby is right now. 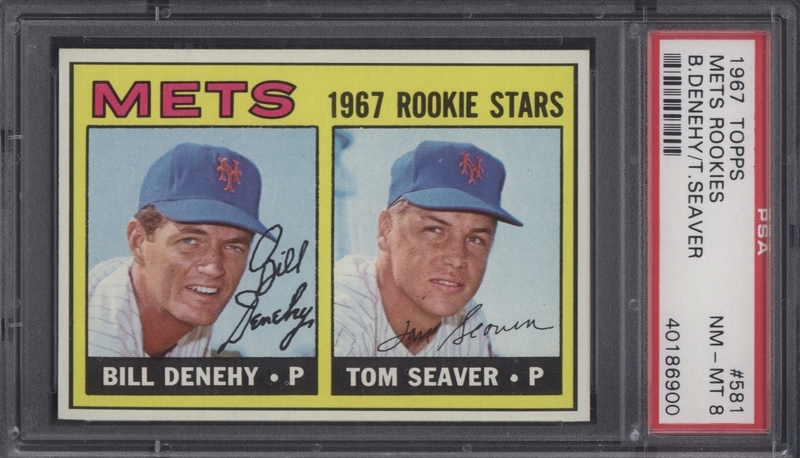 Collectors and investors are paying premiums for high-end vintage rookie and star cards that are well centered even in mid-grade – it’s something we’ve never seen before. No two PSA 5’s are the same anymore. If it’s well-centered, it will carry a premium. Often you’ll hear or read someone say “looks better than it’s technical grade” – and that’s because of the centering. 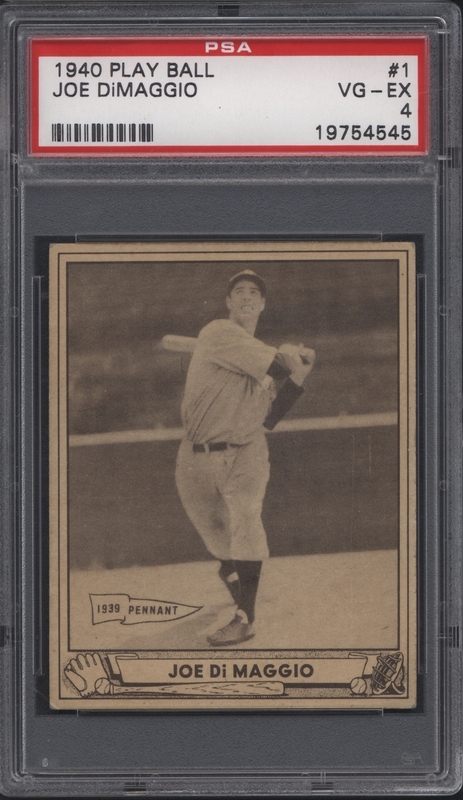 So, not only will you see a well-centered card sell for more in the same grade, but in certain instances, you can even see the same card sell for more in a PSA 5 than it does in a PSA 6! It’s insane! 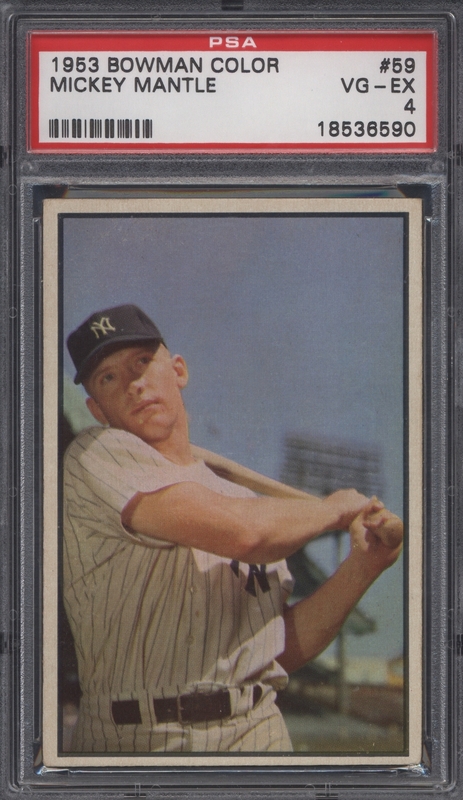 So, not only do I give this guy credit for collecting high-quality cards, but he collected that way decades before the hobby started obsessing over the “eye-appeal” of centering. It used to be all about the corners, but not anymore. 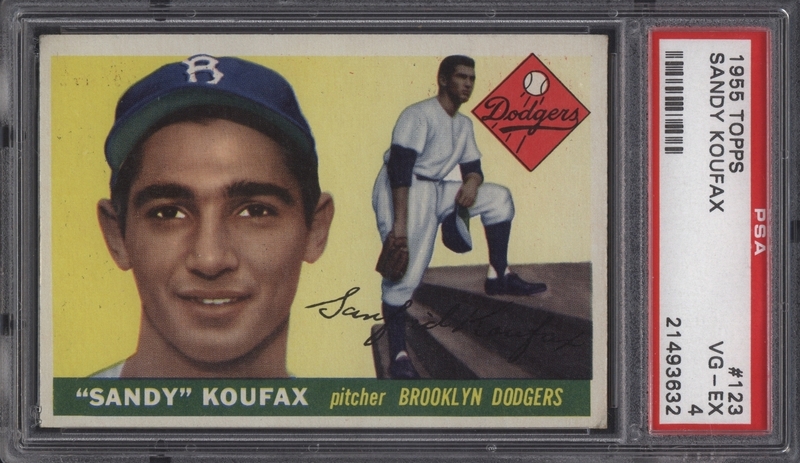 The hobby has a few distinct types of card collectors: those focused on four sharp corners, those focused on finding that dead-nuts centered card, type collectors, and more. We’re finding out more and more that the hobby is leaning towards centering and eye-appeal no matter what the grade is. Let me tell you, it’s a pretty exciting time to be a part of this beautiful hobby! If you only had those eight cards in your collection, you’d be sitting on thousands of dollars. 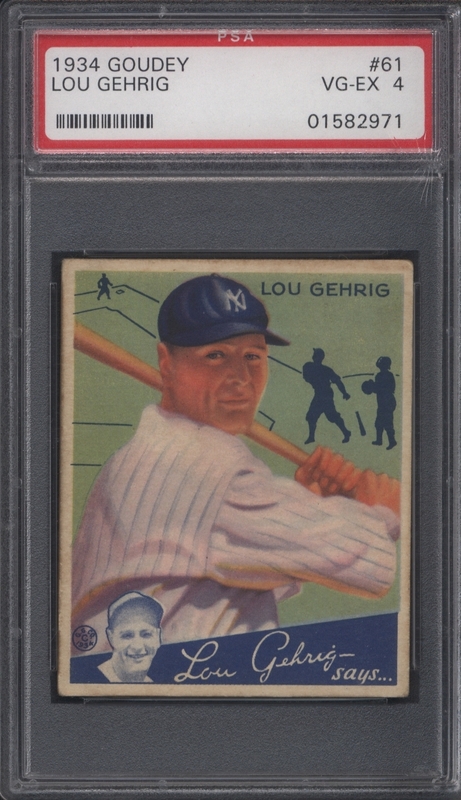 But again, this collector had over 2600 graded cards in his collection, just like the ones seen above. Now you can see why we spent so much time, money, and effort on this collection – from the month-long appraisal process, to flying out to California, to spending an entire day physically going through his collection. It was well worth it. There are two cards from this collection that really stand out to me. 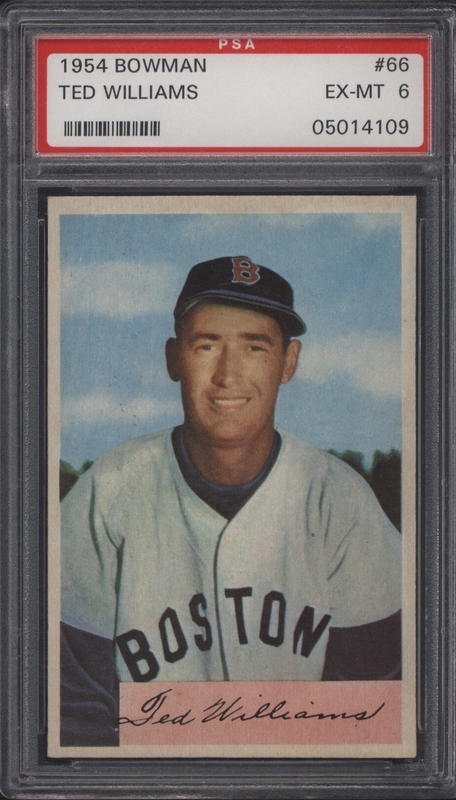 The first one is the the 1952 Topps Jackie Robinson card, which is pictured above. It’s one of the best cards in the entire hobby. Why? 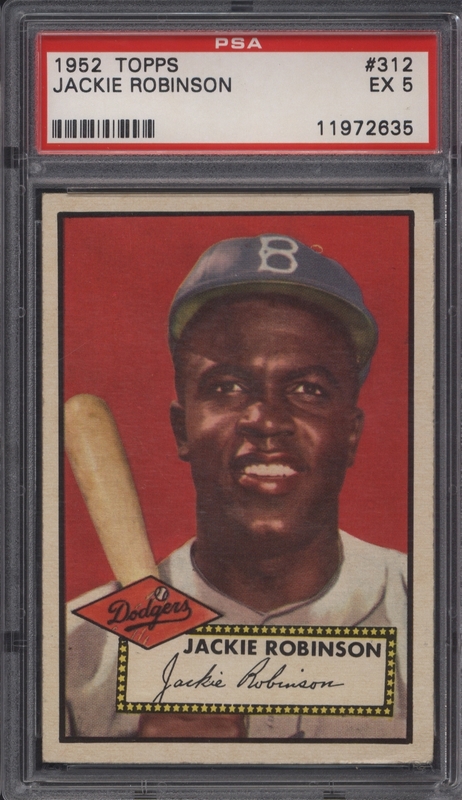 Not only does it come from the 1952 Topps set (which we all know is one of the most collected sets of all time), it’s also a high-numbered card, it’s of Jackie Robinson, and it’s dead-centered. Doesn’t get much better than that! You’d be hard-pressed to find another PSA 5 that looks like this. Actually, I would love to be proved wrong, so if you do have a better looking example, show us! 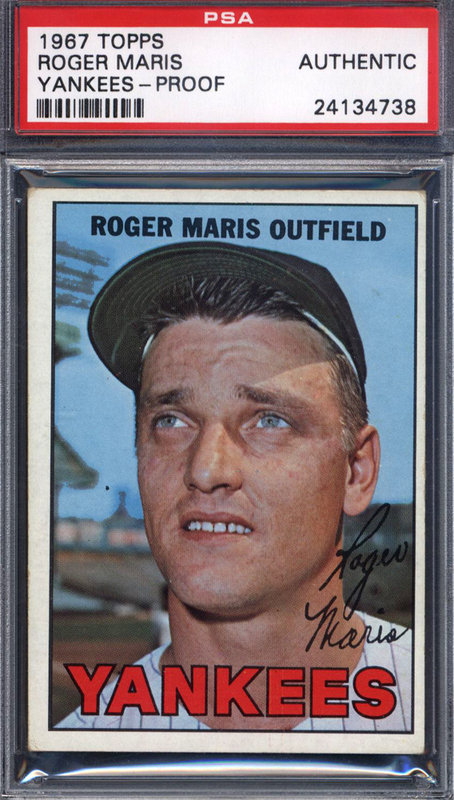 The second card that really stands out, and the one that is my favorite, is the 1967 Topps Roger Maris Yankees Proof card. So what’s the deal with this card? Well, as you know, Roger Maris was traded from the Yankees to the Cardinals just before the 1967 season started. But that wasn’t before Topps had printed these proof cards for their annual set, with Maris being featured on the New York Yankees. Topps quickly made the adjustment, created new a new proof, and and printed the set with Maris on the Cardinals. But, they still had these proofs of Maris on the Yankees. Topps ended up destroying most of them, but some did however enter into the market. To our knowledge, there are less than fifty of these 1967 Maris Yankee proof cards floating around, and we’re excited to have one of them! Unlike the rest of the collection, this card is a bit off-centered, but every example of this Maris proof is the same way, so it would be impossible to get one centered. This is an incredible collection, and we were happy to be a part of the selling process for this California-native collector. So, this got us thinking. PSA has encapsulated over 11 million baseball cards. Well, where are they all? There has to be tons of people out there with collections just like this one, and we’d love to hear from you! So, give us a call, tell us what you have, and let us know when you are ready to sell – because we are ready to buy! In the last month alone, we have traveled from coast-to-coast buying collections, and have spent over $100,000 – so don’t be shy! "Just Collect recently bought my collection of vintage cards. I have been buying and selling cards for over 40 years now so I have had plenty of dealings with dealers. I decided I wanted to sell my entire vintage collection of mostly PSA and SGC graded cards. I called a few "reputable" dealers and most simply gave me a quick "low ball" offer. One dealer kind of "scoffed" at my cards because they were not PSA 9 or 10's. This was just after about 5 minutes on the phone. Scott Alpaugh the Vice President of Just Collect took the time to go over my entire inventory (each and every card that I sent on a spreadsheet) and their offer was "in the ballpark." So Scott flew out here to California from New Jersey and made a very fair offer. We went over each of the cards (the collection was about 2700 graded cards). I must say that Scott was very thorough and professional... In this case the profit margin was small so I think the offer was fair to both Just Collect and myself. I could have sold the cards individually myself and maybe gotten around 70-80% (retail) but then you have to consider fees (auction and ebay/ Paypal fees) which come to at least 13%, not to mention the time spent selling and shipping the cards on your own. So we packed up the cards and Scott took care of shipping the cards back to New Jersey at their expense. I hate to think of what the shipping fees were. So I would highly recommend Just Collect if you are considering selling your vintage collection... It was sad to see that collection go, but I don't feel too bad because the money is going to get my wife a nice car and help my daughter when she goes to college. So all is good."